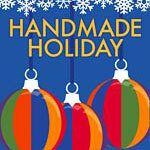 If you’ve missed Handmade Holiday, you’re not alone! By popular demand, this beloved event will return for the 2015 winter gift-giving season. Dozens of regional crafters and artisans will showcase jewelry, ceramics, knitwear, candles, and much more.